If you have an aquarium that is ten gallons or smaller, congratulations, you have a Nano tank! This means, you definitely need to consider the best nano protein skimmer for your tank. Typically, aquarium enthusiasts turn to Nano tanks when the care or maintenance of a large aquarium becomes overwhelming or too expensive. This is also a great alternative for anyone who is downsizing and doesn’t have space for a large aquarium anymore. When cleaning your tank you may find yourself wondering how to just keep the tank clean all the time. Well, a protein skimmer is one way to help your tank maintain its cleanliness longer without killing your beneficial bacteria in the process. Protein Skimmers – What they are and how to use them! A protein skimmer is also called a foam fractionator, but essentially it is like a mini filter. It works diligently to remove waste particles from your aquarium. The waste builds up from your fish and uneaten food can build up really quickly. But, with a small tank you see this build up more quickly. Also with a small tank, you don’t want to clean your tank too often for fear of disrupting your ecosystem. Just like with any other type of tank and filter setup, you want to be sure that you have the proper size for the water capacity of your aquarium. While some protein skimmers come as a complete kit, which is preferred, others you might need to buy in parts. Many come with specific instructions for the particular model, but in general, setup is similar across the board. Assemble any parts from the box, settle it into your tank, ensure that your hoses are setup correctly so they don’t leak and then turn it on! The most important aspect that might impact your decision making here is efficiency. If a protein skimmer has to run for ten or twelve hours for you to see results in a twenty-gallon tank, something is not right. An efficient protein skimmer will quickly filter through the water of a small tank. The second thing to take into account is size. As you are already building a Nano tank you don’t want to lose valuable tank space to an internal filter. Although there are many great internal filters out there, and some on this list, weigh with great consideration how much space you’re willing to lose. This skimmer is designed to not sit inside your tank, but instead in a sump. Keep this in mind asit is not on your list of preferences in choosing a skimmer. Many owners acknowledge though that this skimmer has good longevity and can work without issue for years. 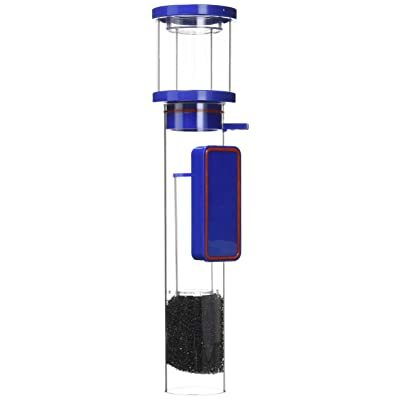 The best feature of Eshopps Nano Protein Skimmer is the simplicity in design. The skimmer runs on extreme energy efficiency. It is quiet and functions seamlessly in delivering clean and clear water. This is a great pick for some; however, it is pricey and can be space consuming for such a small tank. It is intended for ten to thirty-five-gallon tanks and many aquarium owners aren’t quite ready to make more space for a skimmer too. For its size also it is recommended to take into account how heavily populated your tank is. If you have a full twenty-gallon tank you’re probably safe with the Eshopps Nano Protein Skimmer. However, if you have a heavily populated thirty-five-gallon tank, you might want something with a little more pull behind it. This protein skimmer is great for small reef aquariums. It comes in a small size that makes it feasible for mini-reefs or highly populated small gallon tanks. If you’re looking for something small and quiet this could be the model you’re looking for! The best feature hands down is the silence. Because it sits inside the tank and works on a needle-wheel impeller it is extremely quiet. As an added bonus, the needle-wheel impeller boosts the air-to-water contact which comes full circle and helps the skimmer work more efficiently. Because this filter goes straight into your tank, measuring the boxes dimensions and then your tank will help you gauge how much space to clear out when installing this skimmer. Cleaning is very easy with this protein skimmer as it has a sliding “quick lock” design. As the system unlocks you can clean the skimmer without issue! Additionally, the skimmer comes with suction cups to help with mounting. It also has brackets which can be adjusted for the skimmer to fit comfortably into your aquarium. This back hanging protein skimmer stands out from many other protein skimmers simply by being back hanging. Unlike the two skimmers evaluated before this one, it doesn’t take a ton of space inside or outside the tank. Instead, it delivers high-quality skimming in a compact unit. The best thing about this protein skimmer is what’s inside it, the Rock SP600 pump which delivers peak performance all the time. Although it is a great pump, it won’t spike your electric bill because it is also pretty energy efficient. Through a low power setup, it doesn’t generate heat into your tank which is why many aquarium enthusiasts avoid pump based protein skimmers. The Bubble Magus QQ1 looks nice, operates quietly and would be a great addition to many Nano tanks. Definitely what you’re paying for with this model is the space saving aspect and the pump. 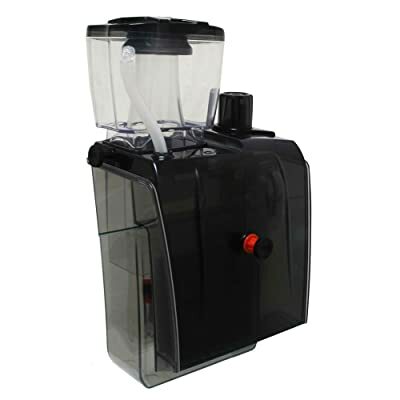 It is very different from the other Nano protein skimmers and stands on its own for power and features. If this is in your budget, it’s worth checking it out. Unlike the other protein skimmers on this list, we see a spike of up to 65-gallons here! This means it’s really great for tanks of about 50-gallons with a reasonable population of occupants. It does create a lot of micro bubbles but is very quiet and remains anchored by magnetic holders. A different take of the traditional protein skimmer, the Tunze is compact and super-efficient. This protein skimmer works so efficiently and cleans so quickly that it is a prime choice for anyone with a saltwater tank, or who has plant life. Coral, reef environments and plants life can benefit from the quick cleaning of this protein skimmer. Its efficiency makes it stand apart from other protein skimmers on the market! This highly efficient protein skimmer creates fine bubbles, delivers effective foam production, but is expensive. If the Tunze is in your budget, by all means, go for it. 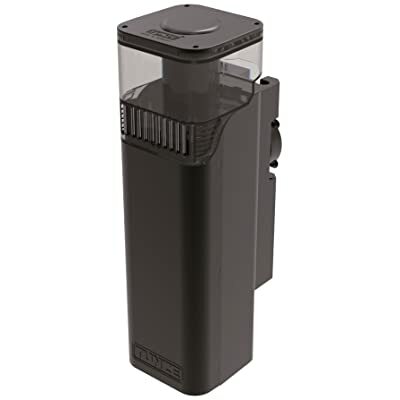 But, if you are working with a Nano tank because of the expenses involved in building a great aquarium, this probably isn’t the right Nano protein skimmer for you. 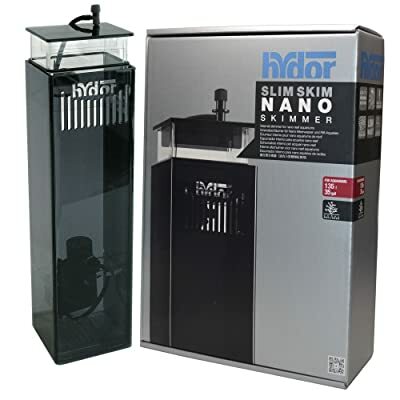 The Hydor USA Slim Skim is an Internal Skimmer for Nano aquariums that fills in the gaps of all the other protein skimmers. It is slim by design, and although it sits inside the aquarium it won’t kill your space. It borderlines on affordability and this will deter some but for the quality, you are getting what you pay for. The feature that is present here and missing everywhere else is the customization in air control and foam level. A peak foaming level can be difficult to achieve with some protein skimmers. They’re constructed for specific water levels, population levels, and aquarium sizes. Instead, with all of these aspects predesigned for you, Hydor gives you the control. Adjustable air control and foaming levels is a unique feature that warrants the price of this protein skimmer. Hydor has built an easy to use and energy efficient internal protein skimmer. Although it is expensive it offers many features that aren’t available on other models. The ability to adjust the levels as you see fit for your aquarium can bring more of that aquarium enthusiasm into your day when building your Nano tank! 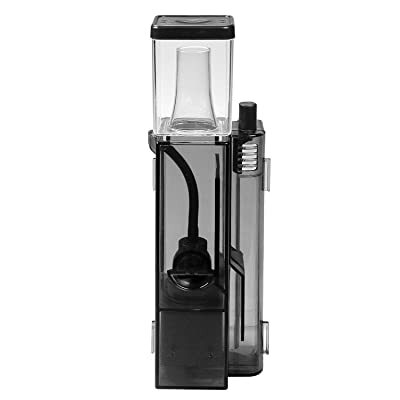 From our investigation, and a lot of user feedback the top pick is the Bubble Magus QQ1 – Back Hanging Nano Protein Skimmer. Many aquarium enthusiasts find they are most comfortable with back hanging skimmers because it gives them more internal space in their aquariums. After all, the space you have to work with inside a Nano tank is already limited. It is also a great value because it works efficiently to remove unwanted waste from your aquarium without a lot of electricity or disrupting your water!